Attach to a hero. Attached hero gets +1 Attack (+2 Attack instead if attacking an enemy with an engagement cost higher than your threat). 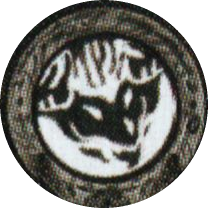 Attach to a Noldor or Silvan character. When attached character attacks an enemy, that enemy gets -2 Defense until the end of the phase. Attach to a Warrior character. Raiment of War counts as 2 Restricted attachments. Attached character gets +1 Attack, +1 Defense and +2 hit points. Attach to a Tactics character. Limit 1 per character. Response: After attached character is declared as a defender, deal 1 damage to the attacking enemy. Attach to a Dwarf character. Attached character gets +1 Attack. Response: After attached character attacks, deal 1 damage to the defending enemy. Attach to a Noldor or Silvan character, or to Aragorn. Limit 1 per character.Attached character gains ranged.If attached character has a printed ranged keyword, it gets +1 Attack during a ranged attack. Attach to a Rohan character. Attached character gets +1 Attack. (+2 Attack instead if attacking an enemy in the staging area). 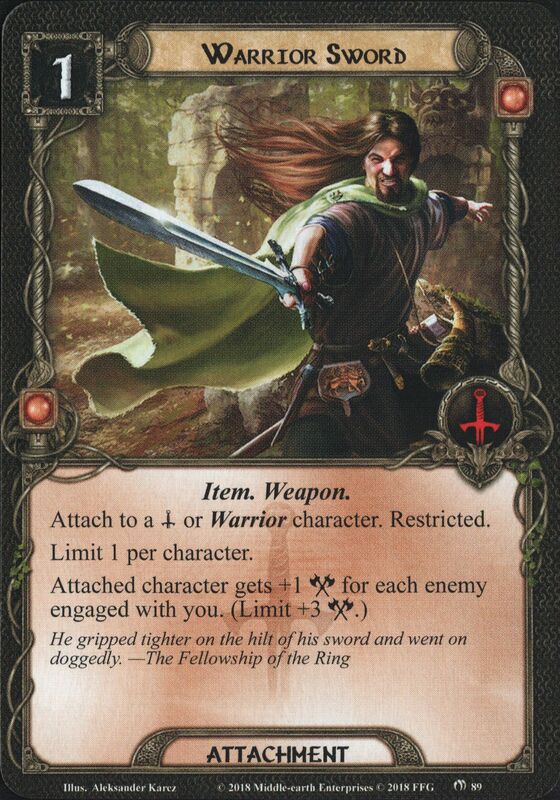 Attach to a Dúnedain or Gondor hero. Attached hero gets +1 Attack. Response: After attached hero participates in an attack that destroys an enemy with 5 or more printed hit points, exhaust Sword of Númenor to add 1 resource to attached hero's resource pool. Attach to a Ranger character. Attached character gets +1 Attack (+2 Attack instead when attacking an enemy with an attachment on it). 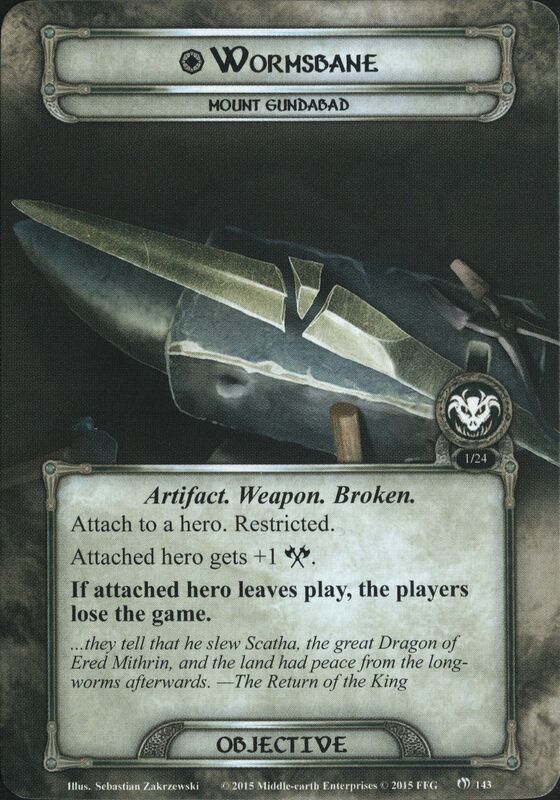 Attach to a Rohan hero. Response: After attached hero is declared as an attacker, exhaust Gúthwinë to give that hero +2 Attack for this attack. If this attack destroys an enemy, return a Rohan ally from your discard pile to your hand. Attach to a Haradrim character. Attached character gets +1 Attack. Response: After attached character is declared as an attacker, it gets +3 Attack for this attack. 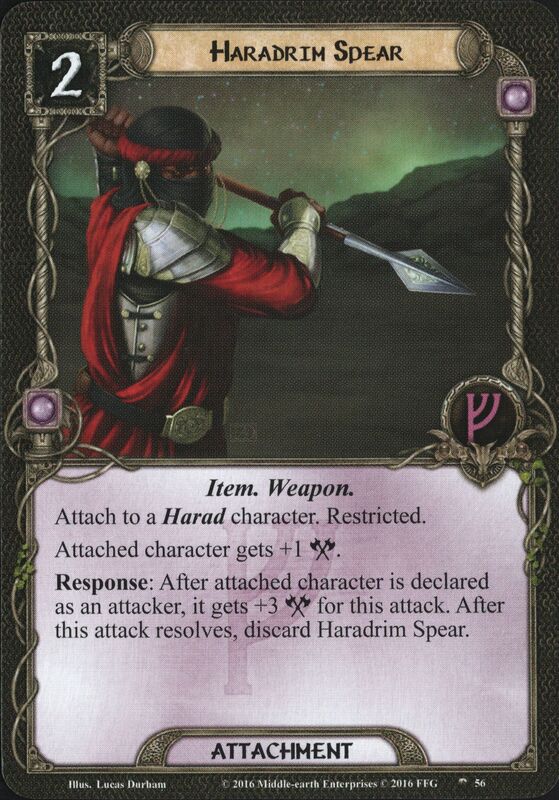 After this attack resolves, discard Haradrim Spear. Attach to Bilbo Baggins. Bilbo Baggins gets +1 Willpower, +1 Attack, and +1 Defense. 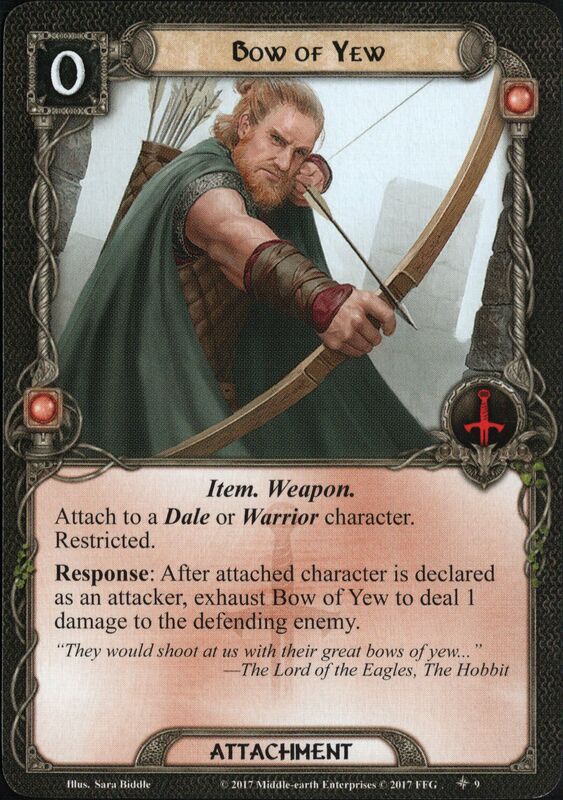 Response: After Bilbo Baggins exhausts to defend, discard the top card of the encounter deck. Deal damage to the attacking enemy equal to the discarded card's Threat. 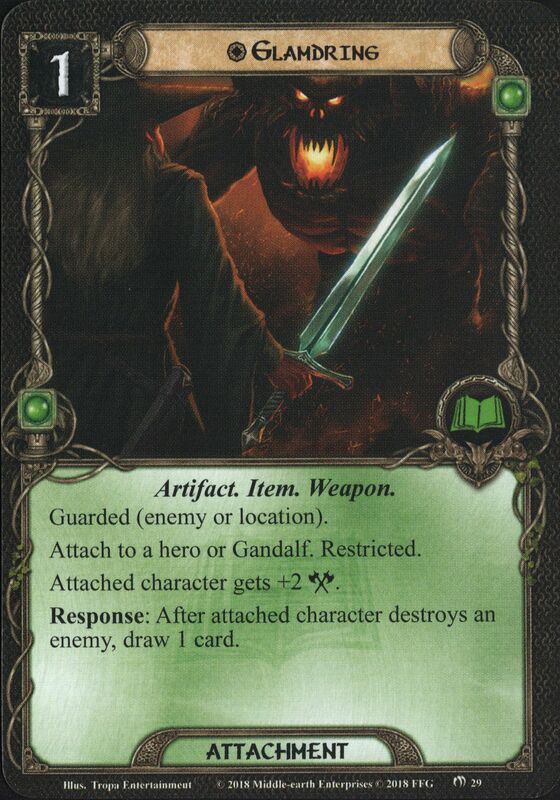 Attach to a hero or Gandalf. Attached character gets +2 Attack. Response: After attached character destroys an Orc enemy, draw 1 card. Attach to a hero. Attached character gets +2 Attack.Response: After attached hero destroys an Orc enemy, add 1 resource to that hero's resource pool. Attach to a hero. Attached hero gets +2 Attack. Response: After attached hero drestroys an enemy, add 1 resource to attached hero's pool. Attached hero gets +3 Attack. If attached hero is a Dwarf, it gets +1 Willpower. Action: Exhaust a hero to claim this objective. 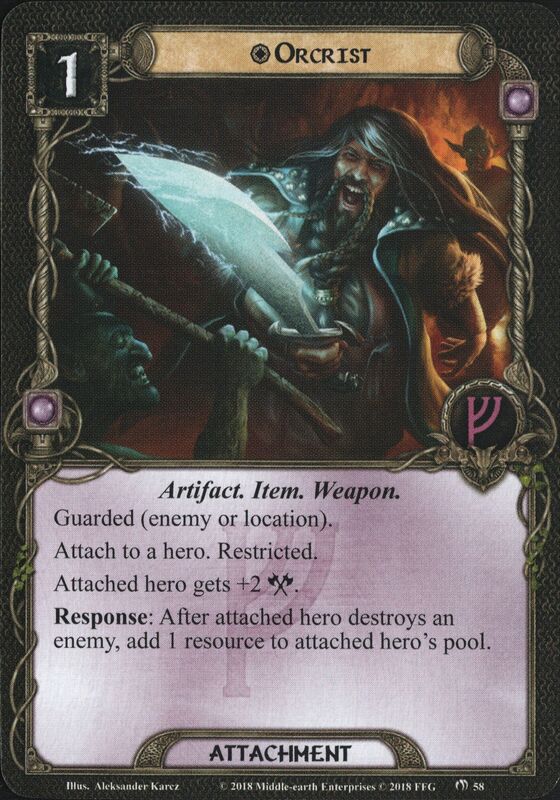 Then, attach Durin's Axe to that hero as an attachment. Attach to a Hobbit hero. Attached hero gets +1 Willpower, +1 Attack, and +1 Defense. Response: After attached hero is declared as an attacker or defender against an enemy, deal 1 damage to that enemy. Attach to a hero. Attached hero gets +1 Attack. If attached hero leaves play, the players lose the game. Attach to a hero. Attached hero gets +X Attack, where X is 1 more than the number of quest cards in the victory display. If attached hero leaves play, the players lose the game. 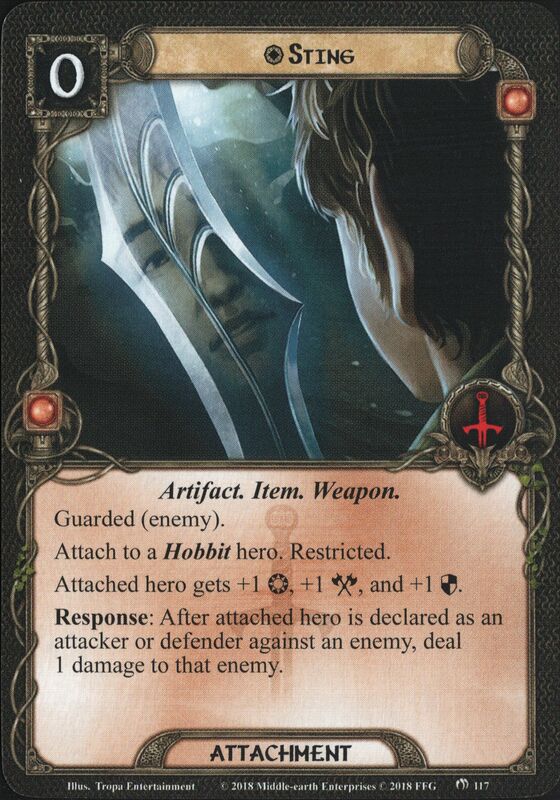 Attach to a Hobbit hero. Attached hero gets +1 Willpower, +1 Attack, and +1 Defense. 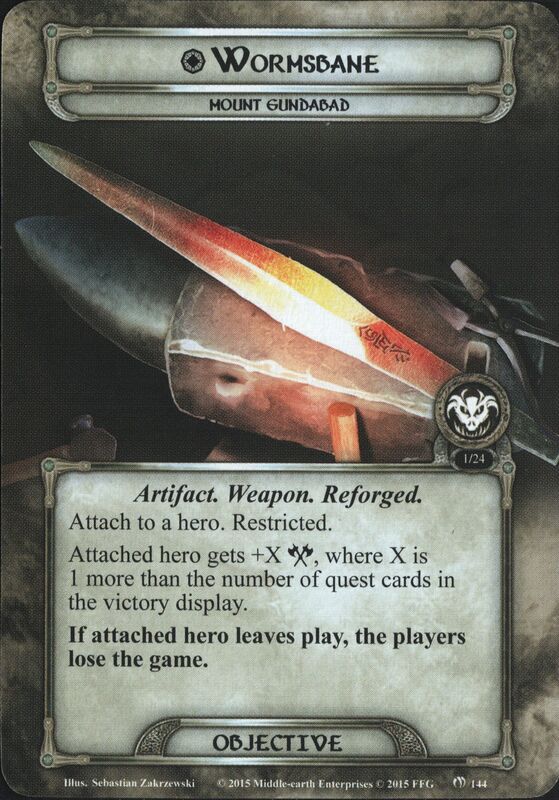 Response: After attached hero exhausts to defend an attack, discard the top card of the encounter deck. Deal damage to the attacking enemy equal to the discarded card's Threat. Attach to a Noble hero or Aragorn. Attached hero gets +1 Willpower, +1 Attack, and +1 Defense. Response: After an attack in which the attached hero defended resolves, exhaust Andúril to target the enemy that just attacked. Declare attached hero as an attacker against that enemy (and resolve the attack). Attach to a Dwarf character. Attached hero gains +1 Attack. Response: After attached character attacks, deal 1 damage to the defending character. If unattached, the first player claims Sword of Belegost and attaches it to a hero he controls. Attached hero gets +4 Attack. Response: Exhaust Sword of Belegost to cancel a shadow effect just triggered.